With a fair amount of snow on the ground in the begining of December, dry boulders were a little hard to come by this month. But that didn’t stop local climbing master Dustin Sabo from snagging an ascent of “Eminently Climbable” V11 at the PCT Boulders. Dustin is no stranger to hard climbs and he thinks the grade is pretty dam close to the given V11. I hooked up with Tommy Herbert and got a tour of Purgatory and the Pyramid Highway areas. These zones are cool and a great place to get out of the snow. 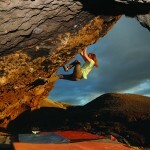 Riley Herbert on the Nevada Boulder. Tommy Herbert working a project near the Cowpie Boulder-Pyramid Hwy Area. 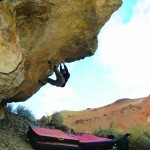 2 new lines were added to the Aspen Loop Boulder in Woodfords Canyon. Both lines are V7 and they were put up by Dave Griffith and Roman Yalowitz. Other than that the weather pretty much shut down most new route develolpment in the basin until the snow melts or things warm up a bit. I have been hard at work wrapping up the final touches on the “Outlying Areas” book. It should go to the printers by March 1st and shops will have copies around June 1st, just in time for summer. The areas included are: Doyle, Purgatory, Pyramid Highway, The Family Boulders, The Keystone Boulder, The Washoe Boulders, Prison Hill, Jobs Peak Boulder, The Sierra Buttes, White Rock Lake, Highway 20 Areas, Loon Lake, Woodfords Canyon, The Ronin Boulder, White Kong, Bear Valley, Sugarloaf, Erratica, The Freaks, The Platinum Boulders, Gods Country, Fiber Optics, The Egg and Caleveras Dome….Holy Crap that was a lot of work!!!! I think climbers are really going to find this book very useful and a great addition the their guiedbook quiver. From all the desert spots that remain climbable through winter to all the high elevation areas sitting on the outskirts of Tahoe, you will now have thousands more problems to go expolore. After finishing this 3rd book I am now convinced the Lake Tahoe area holds some of the best and most diverse bouldering anywhere in the states, if not the whole world. And did I mention the weather in california…..